Chime! Whistle! Jingle! For Recommended Ages 3+. Your child will be delighted by this busy band in a box set. 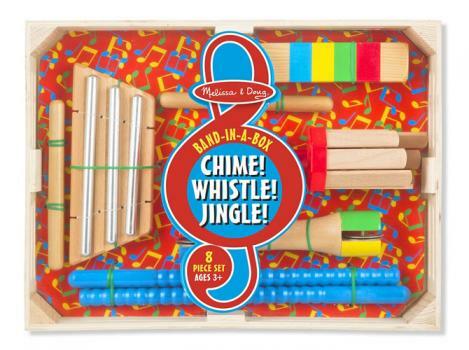 It includes a triple set of energy chimes with mallet, a Jingle Stick to spin between hands, Rhythm Sticks, a Train Whistle, a stur drum (mallet is dragged around inside), The storage box measures 14.5" x 11" x 2.5" There are 8 pieces including the mallets. Promises a lot of fun while learning rhythm and sounding off like a train.